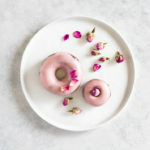 Soft and moist baked chocolate donuts dipped in a sweet creamy glaze flavored with just a hint of rose. Gluten free. Paleo. In a large bowl, sift together almond flour, arrowroot, coconut flour, cacao powder, baking soda, and salt. Set aside. In another bowl, whisk together eggs, maple syrup (or honey), melted fat of choice, vanilla, and one tablespoon of milk. Add the dry to wet and mix until fully incorporated. Fill each cavity in donut pan 3/4 full (I like to use my reusable piping bag but you can use a zip-lock bag with the corner cut out as well.) Tap the pan on the counter several times to allow the batter to settle. For mini donuts, bake for 10-12 minutes, until toothpick comes out clean. For regular sized donuts, bake 12-14 minutes. Remove from oven and cool for 10 minutes then gently tip over onto a cooling rack. Allow to cool completely before adding glaze. When donuts are cool, prepare glaze by melting coconut butter and coconut oil in a small double boiler (I place a small glass bowl over a small pot). Whisk in 1 tablespoon of sweetener and 1/2 teaspoon of rose water. Taste and add more sweetener and rose water if necessary. Don’t worry if it gets clumpy. Remove from heat and whisk in hot water 1 teaspoon at a time until glaze is smooth and glossy. Keep whisking. It will get there. Add fresh beet juice a few drops (or a sprinkle of beet powder) at a time until you get desired pink color. Dip each donut into glaze. Place on parchment paper until glaze is set. Serve and enjoy. Best served fresh, but you can store in fridge for up to 3 days. Flour substitutions: if you do not have arrowroot powder, you can just sub 1/4 cup more almond flour. The arrowroot just lightens the texture a bit. Rose water can be potent, so I recommend starting small with just a 1/2 teaspoon in the glaze. You can add more to taste. And yes, you can totally omit the rose water if that’s not your jam. Try adding a bit of vanilla extract instead. Beet juice imparts a very strong color very quickly. If you are going for a pale pink color, be sure to go very slow, adding just one drop at a time until you have the color you like. You can also use dried beet powder. Use just a sprinkle at a time.